als neueste Ausgabe in der Reihe Kartonowy Arsenal von Halinski gibts jetzt die Spitfire IXc. Und jetzt muss Sparrowhawk uns nur noch erklären, was der Unterschied der IXc zur Vb ist. Martin, dein Einsatz! on two polish forums there is a hot discussion about this model. Pity is that this kit doesn't look like Mk IX - it's probably simply Mk V relased by this publisher some time ago and relased now again with different camo... There were arguments about early version of Mk IX but this exact plane didn't came from rebuilded Mk V. For more please look polish forums. Errata about this will be added to next kit - but problem with version still exists. Thanks TAD for notice, I have looked on Konradus already, but not that much famaliar with Polish to understand all. I just ordered guys from Poland working with me in factory to bring me this one. 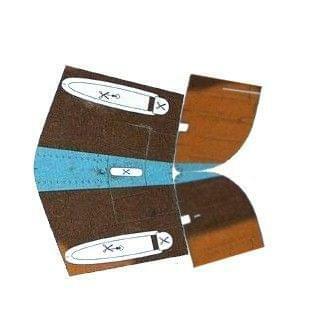 The camo trouble you appointed can be solved easily in this part of plane with chipping dark brown over light areas. But I have seen also a correction part for Me109 E which should be a part of this card. Is this correct? "During the fighter sweeps of late 1941, Spitfire V's were finding it difficult to combat the new Focke-Wulf 190a 1 which was beginning to appear in ever increasing numbers. It was imperative to produce a Spitfire of increased performance as quickly as possible. Airframe AB 505 was modified by Rolls Royce at Hucknall and in April 1942, the re-engined Spitfire was approved by the Air Fighting Development Unit at Duxford. "The resulting aircraft was the Spitfire IX. Although it was by no means vastly superior to the Fw 190, it had at first the slight tactical advantage of being almost indistinguishable from the Mk. V's. It was basically a strengthened Vc airframe fitted with a two speed, two stage Rolls-Royce Merlin 60 series engine. (This increased the overall length from 29 ft. 11 ins. to 31 ft. 1 in.) Radiator installation was also changed to one Morris QCP coolant radiator in each wing plus a QCR inter-coolant (starboard) and a QCQ oil cooler (port), and it was this double, or symmetrical radiator installation, plus the longer nose, modified cockpit cover, and four blade airscrew which set spotters agog in '42." The article notes that many would say that this aircraft was "not far from perfection", and also that "although it was only an interim type the Spitfire IX was produced in greater number than any other single Mark, 5,665 being produced in all. A few of these were produced with floats and modified ventral fin area." Some may ask what happened to the Spitfire versions between Mk V and Mk IX. The answer is that the Mk VI, VII, and VIII were all specialized types, which followed later than the interim type Mk IX. Another point of confusion is that Mk IX aircrafts fitted with the Packard (instead of Rolls Royce) Merlin 60 engine were designated Mk XVI. Furthermore, all these Mk XVI, plus later aircraft in the original Mk IX series, were fitted with a more pointed fin. This may be one of the reasons for the discussion about the "authenticity" of the present Halinski Mk IX model. Not having seen the model (neither a three-view, nor photos of the prototype) I can't have a firm opinion. However, given that the airscrew is four-bladed, then if there are double and symmetrical coolers below the wings, and if the nose is 11 mm longer than the model of the Vb, then I would say it is an authentic and representative model of the Spitfire IX with a Rolls Royce Merlin 60 engine. Well the cockpit has about 91 kg of addictional armour. Besides - as I said - this exactly plane isn't early rebuilded version coming from Mk V - this is later version with more advanced modifications - for example they were about wheels, tail and cover of the engine. Model in this kit do not reflect them - not saying about lack of ailerons. Bernie - errata to Bf is ok - it conncerns smaller white places after vertical stabilizers. this is another point why I love this place - You can just learn so much besides carmodelling (e.g. aircraft history...) - facts I never gave a thought about considering. Danke für die Info, Martin! Hab mir die Spitfire auch grade angesehen. Die Farbsprünge ärgern mich schon etwas. Sonst aber ein feiner Bogen - falls nicht auch in der Konstruktion noch ein paar Fallen lauern. Bei Halinski bau ich keine Scans; beim Scannen gehen die feinen Farbnuancen einfach unter. Wenn man frisch in den Originalbogen schneidet - das ist wie eine Flasche guten Rotwein öffnen!! !